We’re in the middle of the most amazing project and as part of that I’m discovering more and more about book making (not the betting kind). Of course I want to share this amazing way of creating your own book with you! 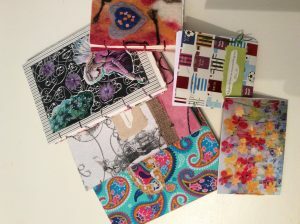 Whether you want to make your own journal, sketch / painting book or a special note book, this simple technique is the same. To start with, it is about keeping it simple and being able to do this at home without lots of expensive book making equipment. 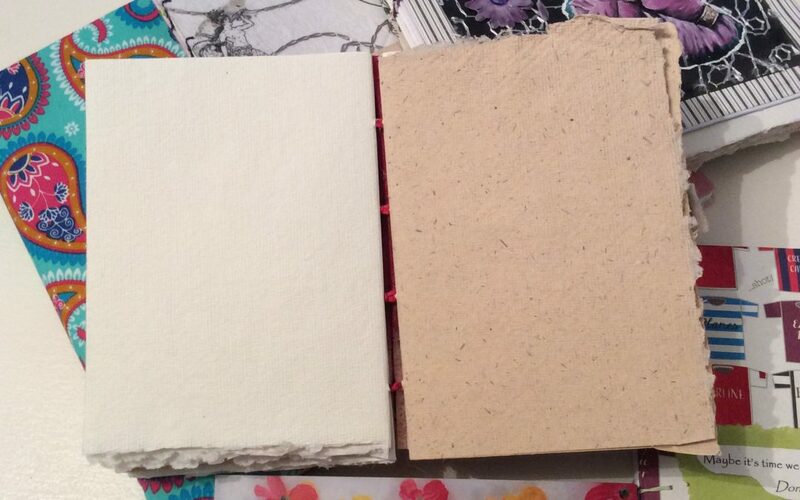 So the books are bound with a Coptic stitched open spine. Not only is it decorative, it is great for being able to see how the book is bound. We started by making the covers. Really this is about being creative and doing what you want. You need a back and a front. This can be as simple or as ornate as you want. You need two pieces of card and you decorate them. You can buy book binding card, however something such as the hard back from a note book or cutting up a cardboard box is fine. Make a cover for the front from a piece of paper (decorative or plain – the choice is yours). The paper should be about 2 – 3cm bigger than the card. glue it on and fold the edges over onto the back – cut across the corners for neater turns on the paper. Then, on the inside, cut another piece of paper that’s slightly smaller than the card and glue this on to cover the edges of the paper from the front that you’ve just folded over. PVA glue is brilliant for fixing on any pictures / fabrics / ribbons. Simply make you cover your way. I also made one cover with the felt from a previous felting class. To stiffen felt you can either use a commercial fabric stiffener or soak your felt in PVA glue and leave it for a day or two to dry. When the covers are dry, it’s time to make your book. Rather than talk through this, the following video is great. Watch and enjoy.